You may bring one cooler measuring no larger than 14-inches by 14-inches by 14-inches as well as one carry-in item such as a backpack or purse into our speedway on race days! Alcoholic beverages are not permitted in accordance with state laws, but coolers may contain any food you'd like to enjoy during our races and unopened water or soft drinks in plastic or aluminum containers. Q: Why is it prohibited to bring alcohol into your grandstands? 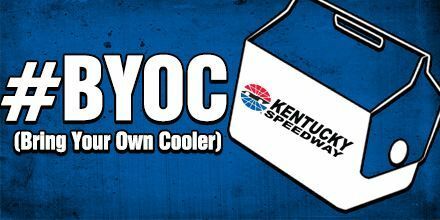 A: Kentucky legislature prohibits licensees such as Kentucky Speedway from allowing customers to bring alcoholic beverages onto licensed premises per the following authorized statutes: KRS 222.202, KRS 243.040, KRS 243.115, KRS 243.250, KRS 243.280, KRS 243.032, KRS 243.033, KRS 243.042, KRS 243.050, KRS 243.055; KRS 243.155; KRS 243.260; KRS 243.270, KRS 243.290, KRS 243.300, KRS 244.080(1) and (2), KRS 244.310, KRS 244.340. Visit http://abc.ky.gov for more information. Q: How long will it take to get through the entrance with my cooler? A: We'll have designated cooler checking stations with ample staff to get you through the line as quickly as possible. For your convenience, we encourage you to arrive early to allow for the extra time to have your coolers and carry-in items checked. 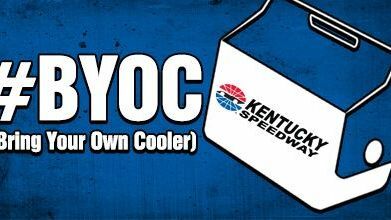 Q: May I exit and re-enter the speedway with my cooler? A: Yes you may exit and re-enter as often as you'd like through designated "Pass Out" gates. Your cooler and carry-in item will be inspected each time you return to our speedway after exiting.